You're gonna make me lonesome when you go"
-- Bob Dylan, "Blood on the Tracks"
Congrats to everybody who knew the answer. Yes, as one deft commenter guessed, our wayward writers were French: they are Symbolist poets Paul Verlaine and Arthur Rimbaud, who were staying at a hotel overlooking Grand Place in the center of Bruxelles, Belgium in July 1873 when their relationship ended ugly. I don't speak French but I love it that the plaque above seems to suggest that Verlaine "blessed" Rimbaud with a pistol shot (the verb, I see, actually means "to injure"). It might have seemed like an act of grace to Verlaine, the older and more lovestruck of the two, and in fact the legend that grew around this incident has done nothing to hurt Rimbaud's mystique. 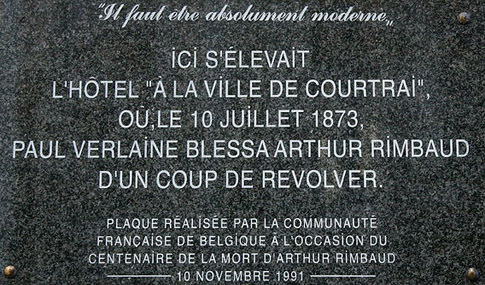 Please note that the plaque pictured above was put up to commemorate Rimbaud, not Verlaine. The fiery young poet was only slightly wounded by the gunshot, but he lost his affection for Verlaine's whole foolish "scene", gradually withdrawing from literary Europe to travel the faraway worlds of Indonesia and Ethiopia as a merchant trader, abandoning poetry forever. The word "infernal" in yesterday's question was, of course, a clue. Rimbaud had a knack for great titles ("The Drunken Boat"? that just rocks), and one of his signature works is called Une Saison En Enfer, or A Season In Hell. As for the hint that "one of these writers has a strong presence on Literary Kicks": in case you didn't figure this one out, Paul Verlaine is our logo, and has been since the site was born. That's him on the top left of this page, in a blue absinthe haze. Rimbaud is probably more popular today than Verlaine (Jim Morrison and Patti Smith have helped to spread the Rimbaud gospel). I've always been more partial to Verlaine's sly, introspective verse. 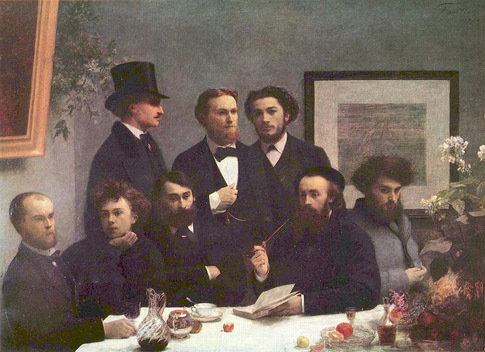 Below is a painting by Henri Fantin-Latour that depicts both poets among a larger group. Verlaine is in the bottom left corner, Rimbaud by his side. This scene would have occurred before the weekend in Bruxelles, obviously. And here's a link to the exact spot on Google Maps. The third Litkicks Mystery Spot question will appear on this site soon! This article is part of the series Litkicks Mystery Spot. The next post in the series is A Little Country Village: Litkicks Mystery Spot #3. The previous post in the series is An Infernal Love Nest: Litkicks Mystery Spot #2. 7 Responses to "No. 1 Rue Des Brasseurs: Verlaine and Rimbaud"
It's funny. The first question I really had no idea, but guessed Gatsby (I didn't post it) and that was right. This one at first I kept thinking -- wow, who could this be? This is a hard one. Then, it hit me later -- boom -- obviously Rimbaud and Verlaine. To make it worse I've just finished Patti Smith's memoir and Rimbaud is present all the way through and she even describes her pilgrimage to Rimbaud's home town in France near the end of the book. And I'm thinking, who'd Dylan write about in this song. And, one more thing, I'd never actually had it sink it that Verliane is the Abstinthe drinker in the Literary Kicks frontispiece illustration. Why do all the quizes so far have to do with being a spot where someone got killed or shot? That's cool, TKG. Yeah, good question ... okay, the next entry will not have anyone getting killed or shot! Now I have to think it up. William Burroughs (or William Lee in Junky) and his wife got arrested for being intimate at the side of the road and getting caught in Beeville, Texas. Indecency. I am not sure the incident is actually in Junky, though. But that'd be a good question for the mystery spot of literary significance -- going from getting killed or getting shot to making love. These are great, Levi! Can't wait for more. Is there an email where I can make suggestions without letting everyone in on them? TKG - no, that's not in Junky. There is a recent book on Burroughs in Texas that relates this period of his life in excruciating detail if you're interested. Sadly, as Burroughs fans know, he later accidentally shot and killed his wife during a drunken party stunt in Mexico. Thanks Dan and TKG. Sure, you can email me your ideas at levi.asher@gmail.com ... I have ideas for at least the next 3 but can always use more good ones. I knew this one was Verlaine and Rimbaud, but didn't ring in fast enough!